I think at the moment I must spend a good 3/4 out of 7 days makeup free because it’s just too bloody humid for a full face! If I even attempt to do my usual moisturise, prime, foundation, concealer and setting powder I have actual beads of sweat dripping down my face before I’ve even got Rosie’s shoes on to leave the house. I've also been suffering quite badly with hay fever, so I’m constantly touching my nose and sneezing (so glam). I decided enough was enough a couple of weeks ago and decided I was going to change up my makeup routine and go for a lighter coverage with a refreshing base. I’ve been starting with the Too Faced Hangover Primer, which is a product I used to absolutely swear by and then when I ran out I somehow forgot it existed. 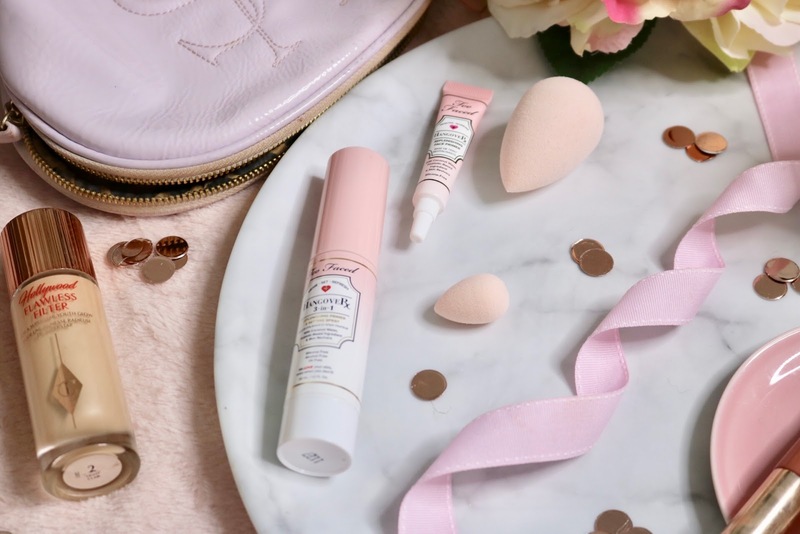 My sister got me the limited addition Too Faced Beauty Blender set for my birthday (pale pink beauty blenders v v cute) and I have rekindled my love for it once again. The primer contains ‘pro biotic ingredients’ which I feel like is something you’d see on a yoghurt advert, and if it’s good enough for Activia it’s good enough for my face ha. I’ve said it before but one of my favourite parts of applying makeup is prepping my skin before hand, and creating a layer of goodness whether that be with replenishing primers or hydrating moisturisers before applying my base. I’ve then been using a quick spritz of the Hangover 3in1 face spray which acts as a primer and a setting spray. I don’t use much of this maybe 2-3 sprays and pat my skin to help it soak it all up. I find the more prepped my skin is, the less likely I am to break out after wearing makeup all day. I received the Charlotte Tilbury Hollywood Beauty Flawless Filter for my birthday and I was so happy because 1) it’s my favourite brand as we all know and 2) because it seemed like exactly what I needed given my current ‘high coverage not coping well in the humidity’ situation. I have the shade light and it’s perfect for my paler complexion, but if I’m fake tanning (which I do most days) I just warm my face up around the edges with a bit of bronzer. The Flawless Filter can be used on it’s own or as a primer under the foundation, but my skin has been fairly good recently so I’ve been using it on its own for minimal coverage and to keep things looking really natural. It seems to just even out my skin tone but also perfects everything at the same time. My skin wasn’t great for a couple of days so I mixed it with the It Cosmetics CC Cream and that worked wonders too for more coverage but still kept that glowy look. I use a Mac setting powder to set my under eyes and T zone but apart from that I’m kind of just letting the rest of my skin breathe a little and trying to keep it natural. I love the fact that you can see some of my little summer freckles through the Flawless Filter sometimes depending on the lighting. Have you changed your makeup routine to suit the weather?? Let me know in the comments! I’ve had the hangover primer on my wishlist forever now, I really need to try it. This sounds like a simple routine! I usually avoid putting anything on my face too much because Texas heat is no joke. But these are some good ways to keep a fresh looking face without doing too much! I'm too self conscious to not wear makeup so I'm that girl with a full face in this hot weather haha!!! 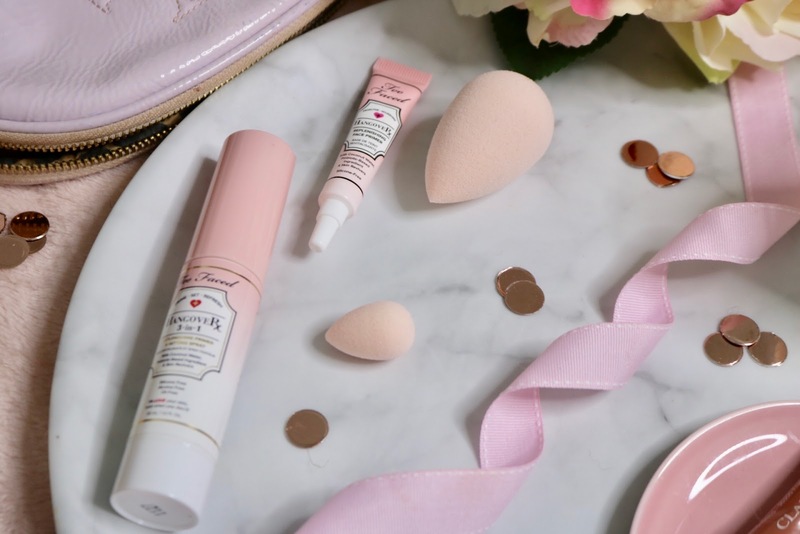 But I do love the sound of the CT product and I would love to try the Too Faced primer also. This is well needed for where I live! I'll try this out and see if it works for my skin! I haven't really changed my routine for this hot weather but I have definitely been having more make-up free days!